You may link current and historical market values of drawing tools, technical indicators and bar data from X_STUDY to and Excel. Once linked, Excel updates in real-time as new prices are generated in X_STUDY. You can also link values from Excel into X_STUDY as horizontal Level Lines that dynamically update as the values change in Excel. These Level Lines help traders identify significant price levels on their charts. 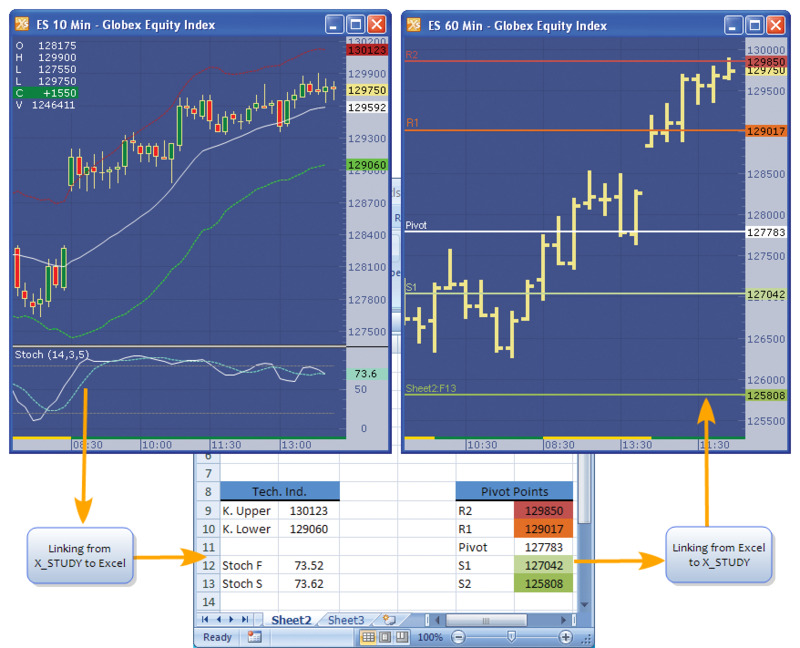 Right-click the drawing tool or technical indicator that you want to link to Excel. Select Link to Excel | Current Value (or Previous Value). Open Excel and navigate to where you want to paste the data. Right-click the Excel cell and select Paste. Open Excel and select the cell with the data that you want to link. Click the Fill tab and select a cell color. Right-click the shaded cell and select Copy. Right-click the X_STUDY chart and select Paste Link. This displays a horizontal Level Line on the chart.